Miles Barr is the man who wants you never to see his product. The CEO and co-founder of Silicon Valley solar startup Ubiquitous Energy is at the cutting edge of transparent photovoltaics. In short, his company is developing transparent solar cells that one day could completely cover the glass on our major buildings. Our skyscrapers could potentially be fully powered by renewable energy from the sun. 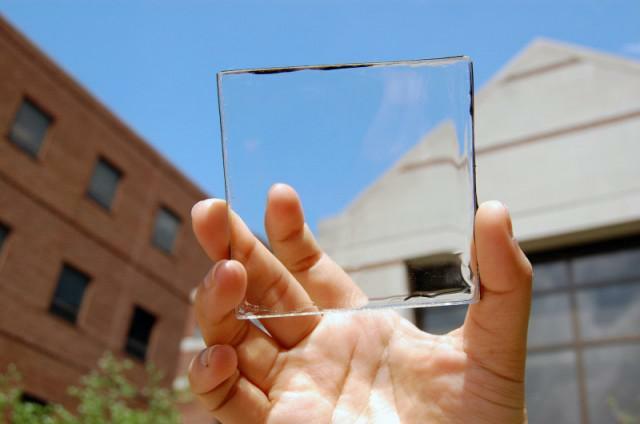 The technology they're developing is an invisible film that can go on any surface and generate power. Traditional solar cells we're used to are opaque and require a lot of space to absorb, harness and distribute as much energy as possible. In congested urban areas this is problematic. This exciting technology could be applied to existing glass surfaces and incorporated into future design. New and separate surfaces would not be required for solar panels as we know them. The ClearView Power technology could have other applications for example on mobile phones, laptops and tablets. Imagine these devices never running out of charge!Called a transparent luminescent solar concentrator, the panel uses organic molecules made to absorb invisible wavelengths of light, such as ultraviolet and near infrared light. The material moves this unseen light to the edges of the panel, where strips of photovoltaic solar cells pick it up and convert it to electricity.